Guts.com is a fairly new online casino, but you won’t notice that at all when you visit their mobile app. Fast loading time and a quick and easy interface: you will find your way around quickly. 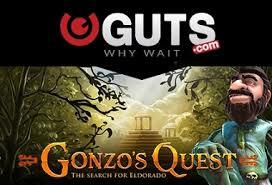 Guts offers all kinds of great casino games, including table games like Poker, Roulette, Bingo and Blackjack. Their collection of online slots is very good and large enough, with well over 250 different machines to choose from. 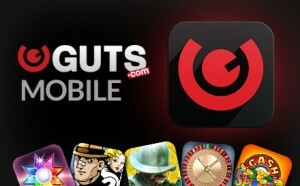 Not every mobile casino offers a mobile sportsbook as well, but Guts.com does. So if you enjoy a combination of being able to bet on your favorite sports with being able to play different types of casino games, chances are that you will find Guts very much to your liking. And just incase you need more encouragement to register at Guts’, they currently offer a signup bonus up to € 300, with and additional 100 free spins on their video slots. No deposit required for the latter. This instantly enables you to play slots for free, whilst being able to win real cash prizes. Guts is quickly winning us over. Another great thing is that it offers live roulette and betting on your tablet. An iPad has never been a betting thrill like this before! The Guts mobile casino is one of the best ones available in our modest opinion. Signing up is easy and very quick, with no obligations whatsoever. Guts guarantees your privacy and you are free to choose if you want to play games in free mode only or choose to start playing for real money prizes, in which cases you will be able to make a deposit using on of their many easy payment and withdrawal options such as PayPal, Ukash, Giropay, Neteller, Skrill, Moneybookers and more. For a full list of their payment methods, please check their site.